Once, long ago, on the gentle slopes of a mountain, there flourished a summer camp for kids. In that secluded spot, the warm sun of July and August smiled on hundreds of children hiking, swimming, dancing, singing... They explored nature; they fashioned arts and crafts. Their camp they called Wo-Chi-Ca. Nearby farmers assumed the camp with the Indian name was a place where feather-bedecked children chanted, danced, and sat cross-legged to make beaded wallets. But like an arrow gone wildly astray, these images veered far off the mark. 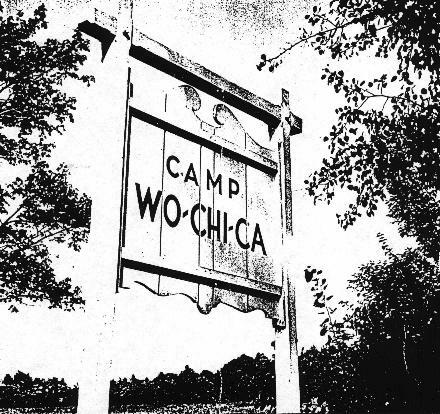 The name Wo-Chi-Ca was a contraction of Workers Children's Camp. Red indeed was the color, but not of Indian war paint. These children of workers would, in the early years, raise a red flag and sing the "Internationale." In addition to blazing red, the camp gleamed a proud black. 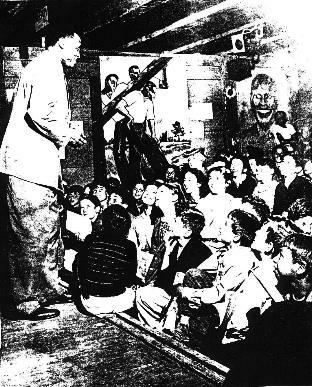 Many Negroes were seen at Wo-Chi-Ca; they comprised nearly twenty percent of camper enrollment and fully a quarter of the staff. Moreover, the camp was host to many Jews as well as a number of Asians, Puerto Ricans, and Italians. These strange city slickers looked, to the natives of surrounding small towns, as if they came off slave ships and Ellis Island freighters - certainly not the Mayflower! Well, wasn't this the American ideal - the true American melting pot? Locals did observe Camp Wo-Chi-Ca to be a patriotic place, always big on Fourth of July celebrations. And well they knew that in the grim war against the Germans and Japanese, some of those camp people died fighting for their country. So the neighbors, while they reckoned the camp to be pretty peculiar, allowed that Wo-Chi-Cans were American enough to meet on the diamond in many a friendly baseball game. That is until 1950. Then, seething with hate from the Cold War and Red Scare, local "patriots" converted their playful bats to lethal clubs. They assailed campers verbally and physically. "Wo-Chi-Ca stands for integration, integration means Communism, and Communism is un-American!" They invaded the grounds demanding removal of the PAUL ROBESON sign from the Playhouse. In the end the camp had to shut down. Only twenty summers - a brief existence of a small camp in a backwater of New Jersey. Half a century has flown since Wo-Chi-Ca folded its tents forever. And yet Wo-Chi-Ca lives on, not only as a long-lost utopia or childhood dream, but in life-long principles and progressive ideals. True, many similar camps existed at the time. Twenty-seven "Communist camps" operated in New York State alone, according to a government inquisition. But all agree - friend or foe - that Wo-Chi-Ca was utterly unique. How did this short-lived, this evanescent children's camp grow to such legendary proportions? Come with us down the old trails, and hear these Tales of Wo-Chi-Ca.